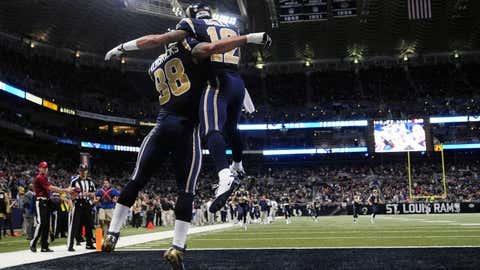 Lance Kendricks celebrates catching a four-yard touchdown pass with teammate Stedman Bailey during Sunday's 27-16 win. ST. LOUIS — James Laurinaitis doesn’t have an answer. The St. Louis Rams’ middle linebacker has tried to figure out where things went wrong, why his team and his defense can look dominant in some games and struggle to stop anybody in others. Laurinaitis knows that next month, when the Rams are watching the playoffs, they are going to be watching teams they beat this season — Arizona, Indianapolis, Chicago and now, New Orleans — and that’s a frustrating thing for the linebacker to consider. The Rams’ 27-16 victory against the visiting Saints on Sunday at the Edward Jones Dome just adds to what has been a frustrating 6-8 season marked by extreme highs and lows. Laurinaitis doesn’t know why it has been like that. The Rams’ defense was downright dominant again Sunday in front of a rowdy home crowd of 58,442. Defensive end Robert Quinn recorded two sacks, his 14th and 15th of the season, forced two fumbles and recovered one. He also pressured New Orleans quarterback Drew Brees on a throw that was intercepted by safety T.J. McDonald on the Saints’ first play from scrimmage. The Rams had two interceptions in the first quarter — cornerback Trumaine Johnson had the other — and three turnovers in the game. The St. Louis offense, which got strong performances from quarterback Kellen Clemens (14 of 20 for 158 yards and two touchdowns) and running back Zac Stacy (133 yards rushing and a touchdown on 28 carries), turned the two interceptions into two touchdowns and an early 14-0 lead. “This was a great team win,” Clemens said. “It really was. Offensively, it starts with the offensive line, and they played great. Obviously, Zac Stacy went over 100 again. I think it was over 100 in the first half. I didn’t get touched. They did a great job. But the questions kept coming, from each corner of the locker room. If the Rams can play like this against the Saints (10-4) and Bears (8-6) and Colts (9-5) and Cardinals (9-5), why don’t they do it more often? Quinn also said that it seems like they rise to another level when they play great teams and sometimes play below the level they are capable of. He mentioned the 14-9 loss to the Seahawks, where the Rams had a fourth-down play at the 1-yard line and a chance to win at the end of the game, as another example. The Rams have had plenty of opportunities this season to write a different story, to win a few more games and snap their streak of now 10 seasons without a winning record. Instead they’ll be watching the playoffs again for the ninth consecutive season. They’ve showed they can compete with and beat some of the best teams in the NFL, with their defense, backup quarterback and rookie running back leading the way. But they’ve also showed they just are not there yet. Sunday’s victory showed defensive end William Hayes that they are still learning. Now they just have to figure out how to do it every week. We’ve got the talent. We just have to put it together and be able to do it week by week. We’ve got to be more consistent. We’ve done played a lot of good teams this year and we done beat them. It shows that we have the talent to do what we need to do.